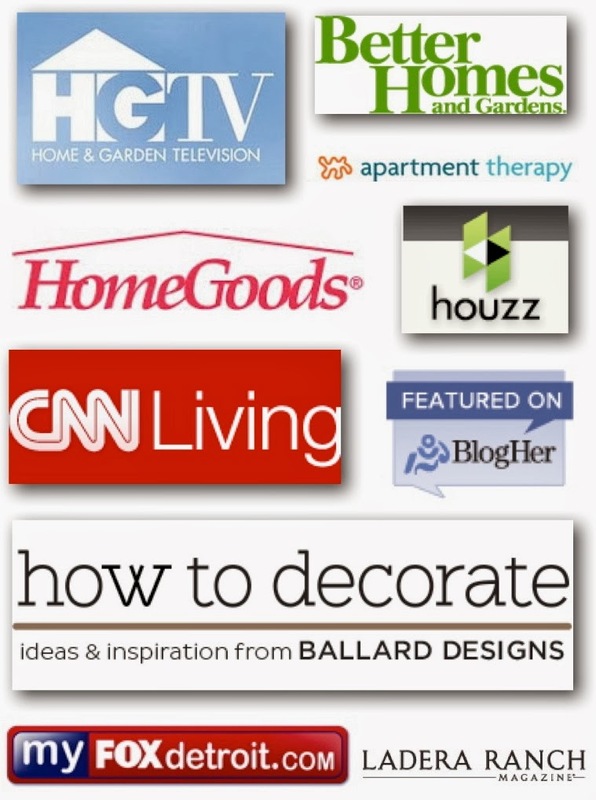 You may remember I took a trip to Atlanta last summer to teach a design class at the Haven Conference. One of the topics I covered was "The Recipe For The Perfect Bed". 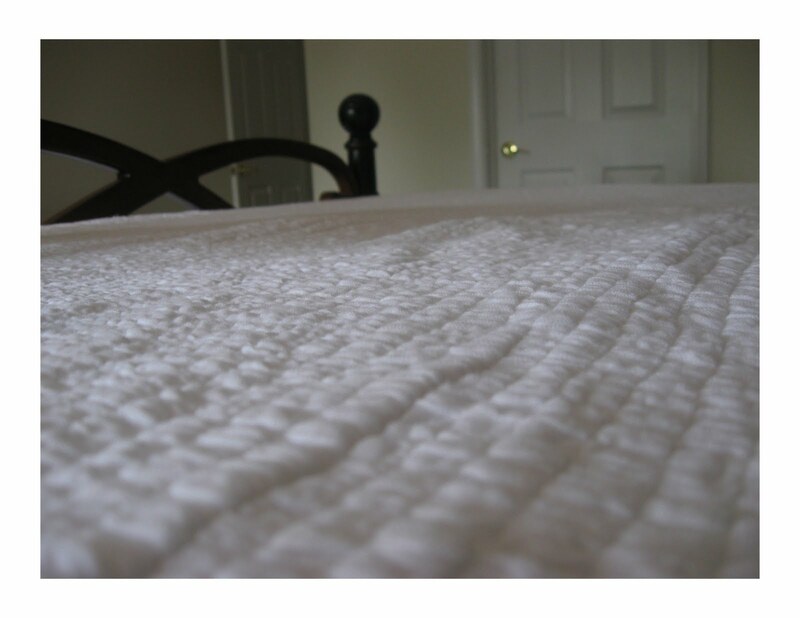 In addition to providing a few top secret tips I also covered some bedding topics I discussed in a blog post a few years ago. 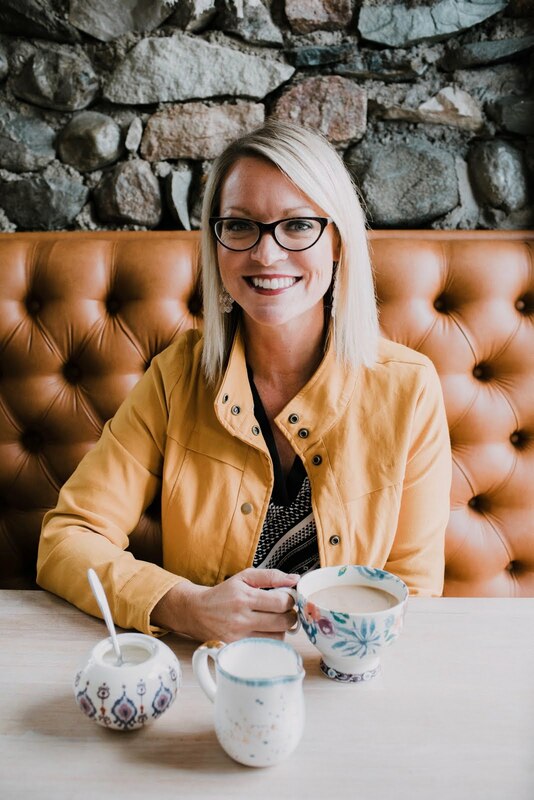 Yesterday, I read that one of my fellow bloggers, Lindsay from Makely School For Girls attended the class, read my post and was inspired to make some adjustments to the recipe to adapt to her southern climate. Lindsay wrote an article on the topic and shares a beautiful example of a colorful, comfortable, perfectly dressed bed in her warm climate (Texas) home. 1. 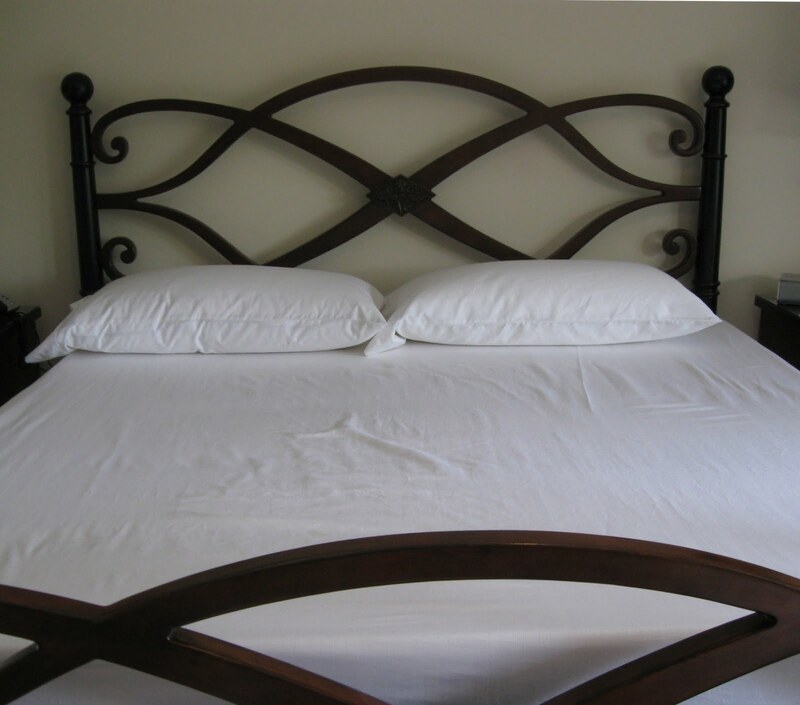 100% Egyptian cotton sheets, 500 thread count. (The cool organic feel of these sheets is totally worth the investment. And the wrinkles). 2. 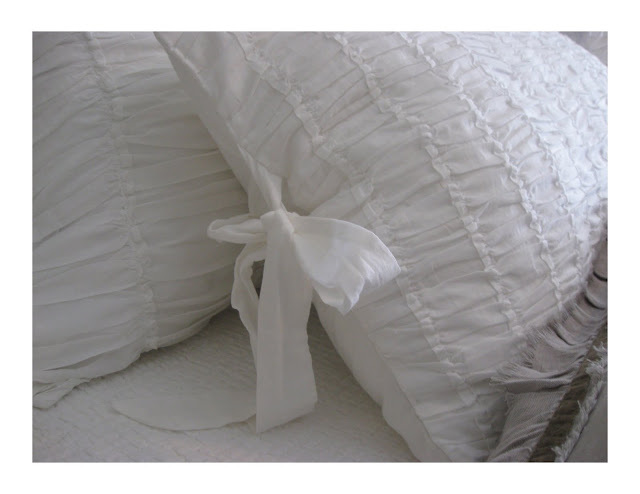 2 Base pillows for sleeping with firm feather-down blend inserts cased in the sheet set shams. Feather-down blend inserts hold their karate chopped shape the best. They are also insanely comfortable. 3. 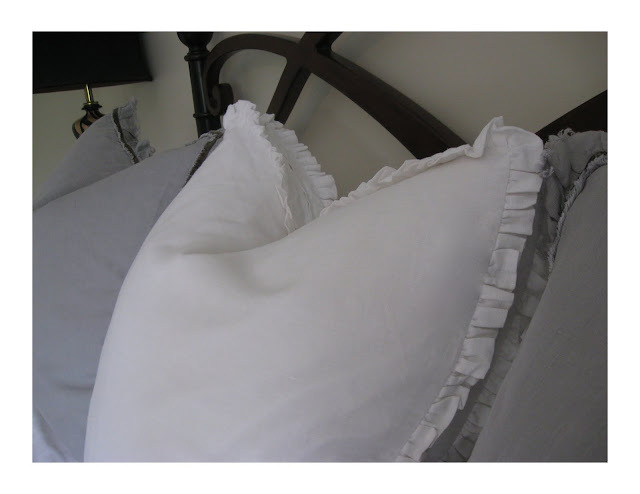 Three Large Euro shams filled with feather-down blend Euro pillow inserts. 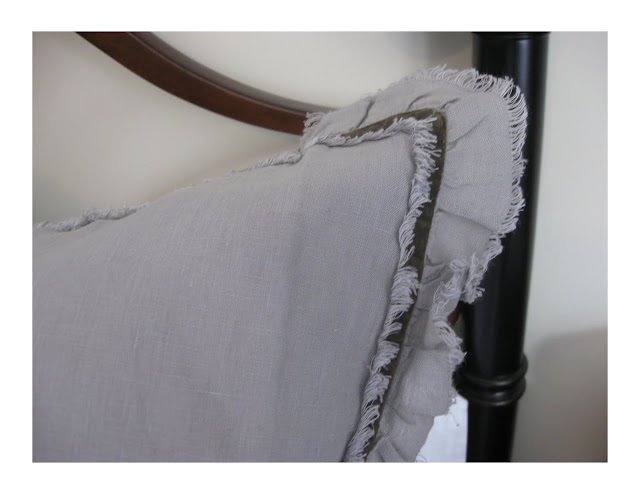 Two in Gray (matching the duvet cover) and one in white with an adorable ruffled box edge. 5. 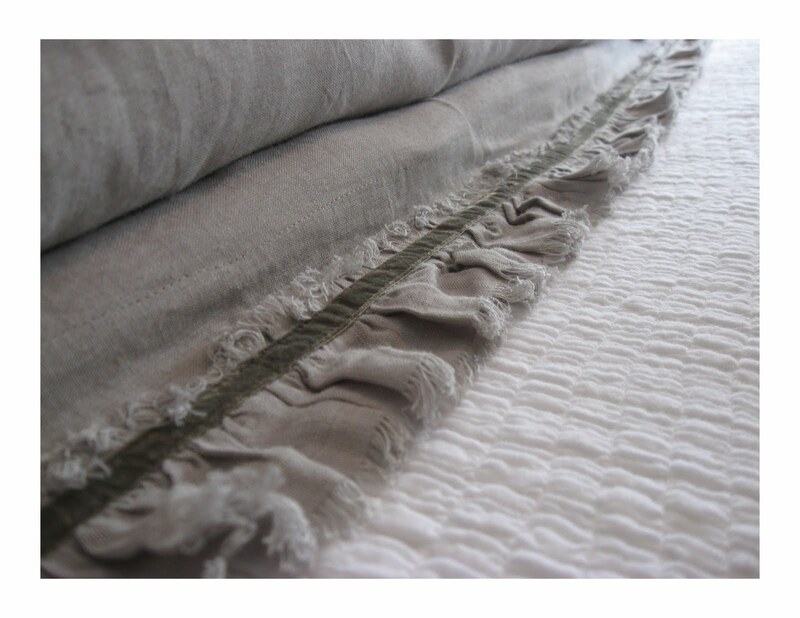 One gorgeous cotton/linen gray duvet cover. 6. 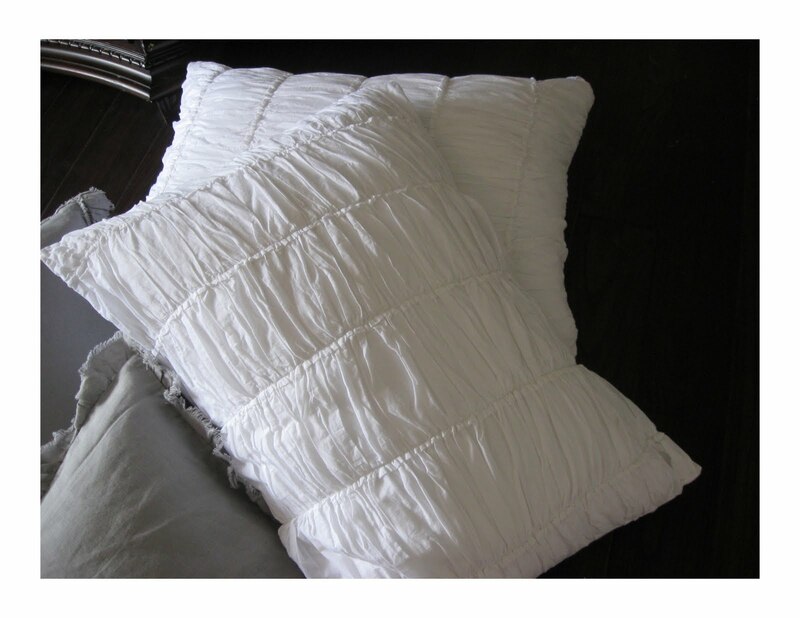 One king sized feather/down high loft maximum fill duvet insert. 7. 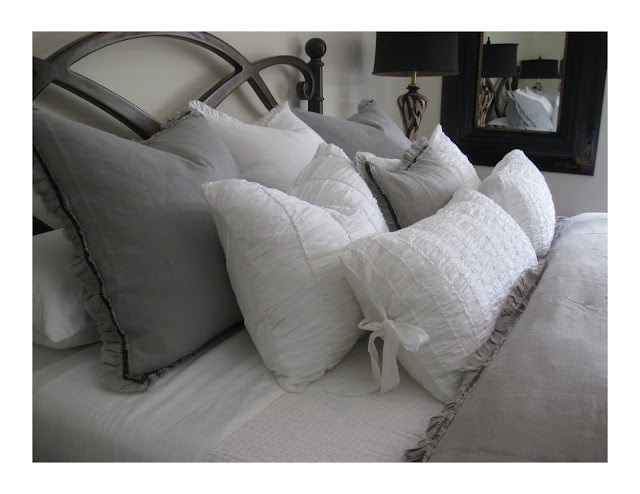 Two standard sized white ruched pillow shams with feather/down extra firm inserts and one gray decorative toss pillow. 8. Two white decorative ruched toss pillows. 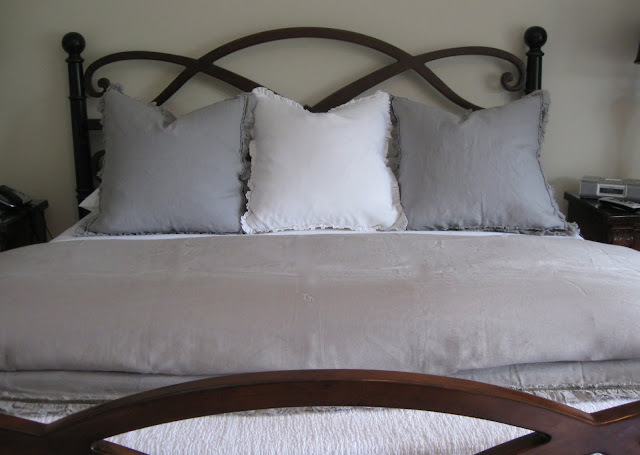 Great post-where did you get the headboard? I love this. 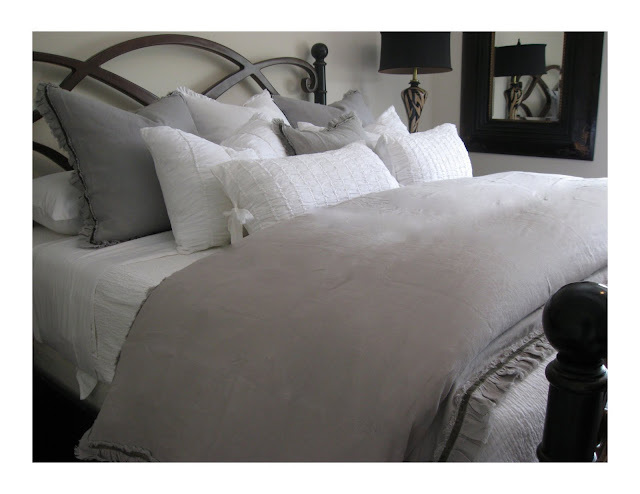 Where did you find the grey duvet cover and shams? 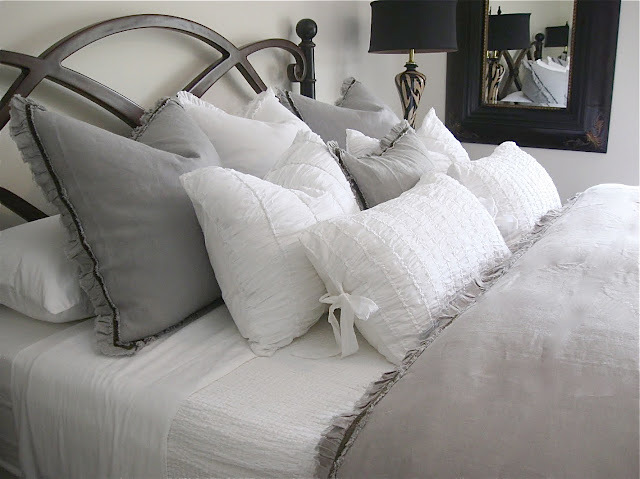 While this bed does looks beautiful, I really don't understand how 10 pillows is necessary or convenient. 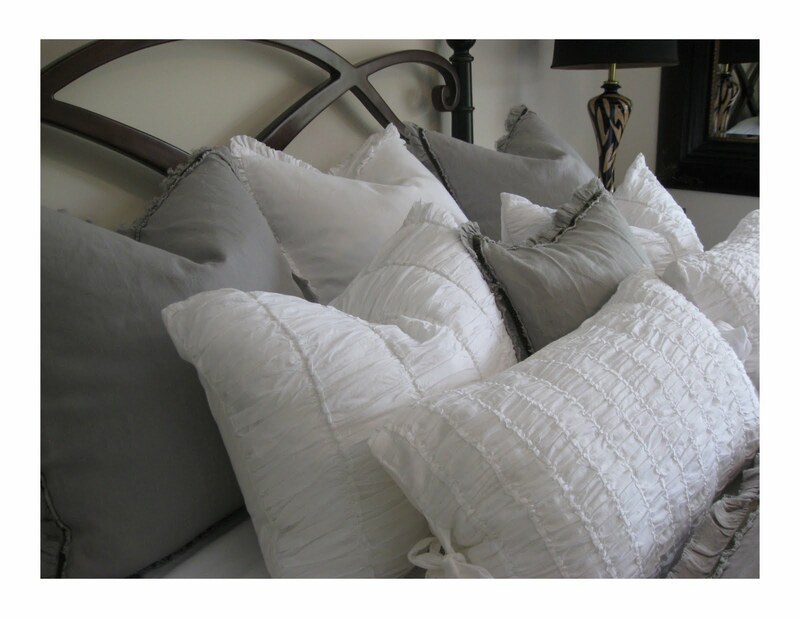 All I see when I look at beds with so many pillows are all of them thrown on the floor while sleeping and never being put back. Can someone with this many pillows tell me how their partner feels about them because I know my man would be saying "no way." Would love to know as well where you found the bed frame/headboard? I'd like to know where you found the bedding also, as well as the inserts for the duvet. Can I find something like that at Target? 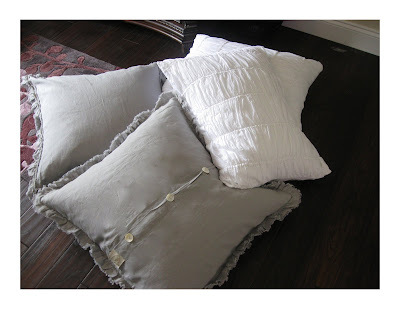 I'd like to know where you found the bedding also, as well as can you find similar duvet inserts at a Target? Great tutorial. 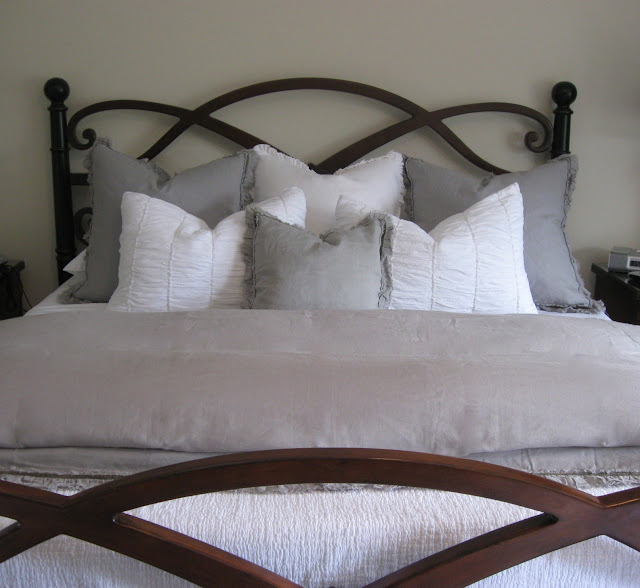 There's nothing like climbing into a perfectly made bed! Love this post!! Will you share with your readers where we can find the bedding? This is gorgeous. I am decorating my living room / office / art space with these colors plus some deep green and deeper azures to brighten. 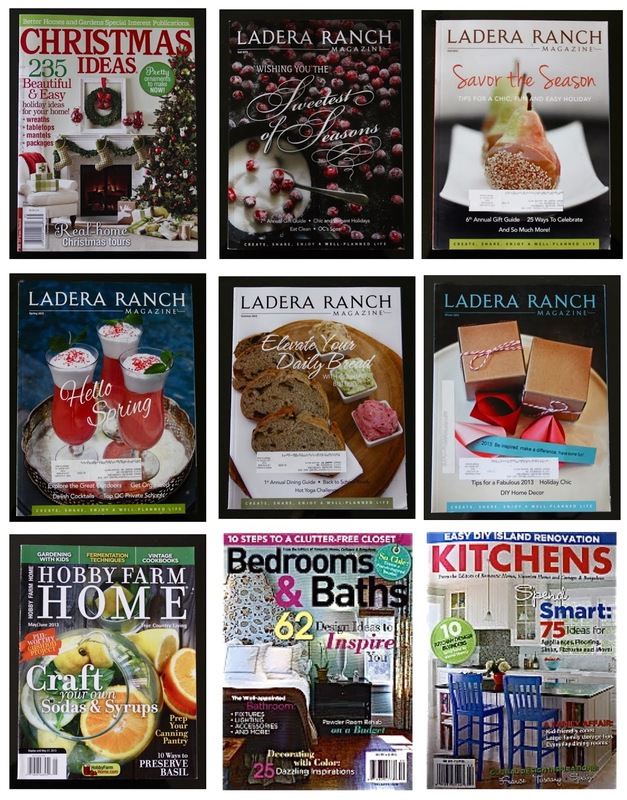 Working on an online inspiration colour board and found your website. Enjoyed thoroughly. Thanks.